Fresh fruit just screams summer. 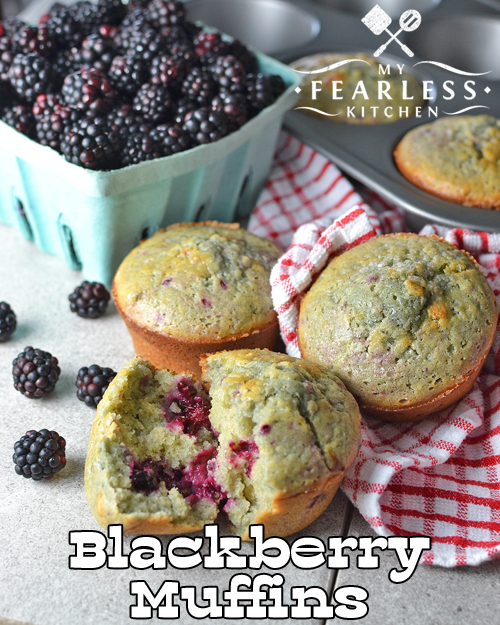 And the fresh blackberries in these easy Blackberry Muffins will have you dreaming of summer anytime you make them! Blackberries just make my summer! 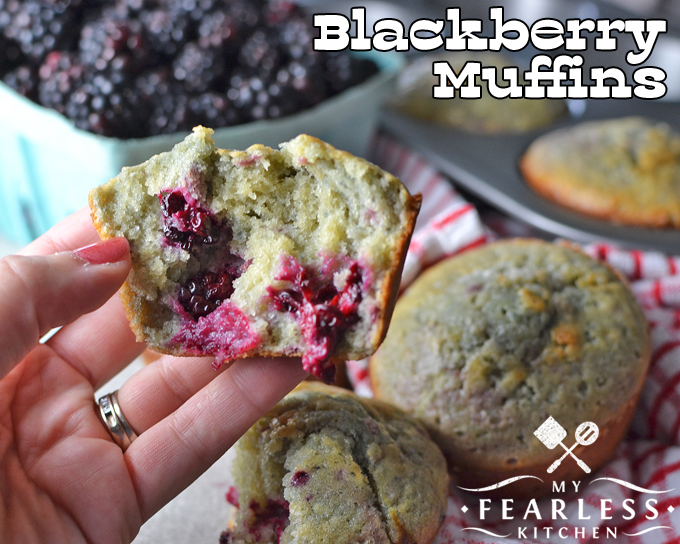 And these Blackberry Muffins will make your morning a little brighter. The recipe for Blackberry Bread is one of my most popular summer recipes. I love that bread, but sometimes I want something that’s a little easier to grab and go with. So I converted that delicious bread into these delicious muffins! I mash the blackberries a little bit before I put them in the batter. 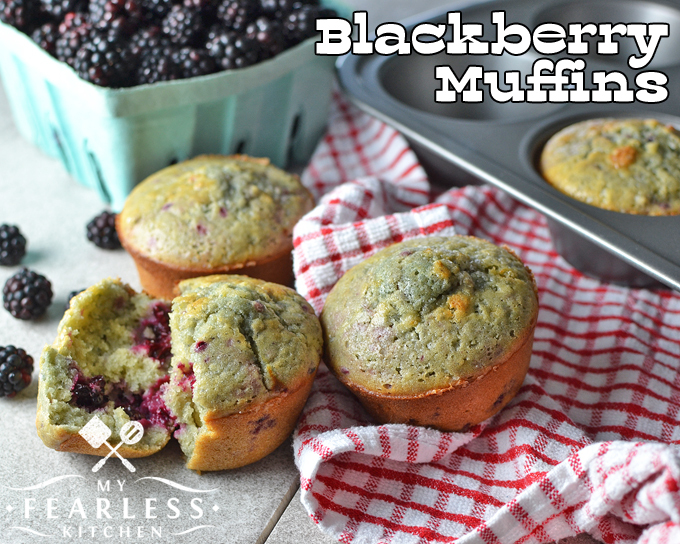 That just breaks them up a bit so you don’t have quite as big blackberry pieces in your muffins. I just use a nylon potato masher (like this one) in a large bowl. I used a muffin pan that makes 6 large muffins, instead of 12 cupcake-size muffins. I’m also thinking of making these in my mini-muffin pan. What do you think? One or two blackberries pressed into the center of the batter? And dip them in some Greek yogurt or this Quick Vanilla Fruit Dip? Yum! In a large bowl, combine flour, sugar, baking powder, baking soda, and salt. Stir gently. In a small bowl, combine eggs, milk, melted butter, and vanilla. Whisk to mix well. Add blackberries to the batter and fold in. Lightly grease 6 large muffin cups (or 12 regular muffin cups). Generously sprinkle decorating sugar on top of the muffins. Bake at 400 for 23-26 minutes for large muffins (16-18 minutes for regular-size muffins). Yuumm! I am always looking for things to do with all the blackberries I get each summer – thanks for sharing on Homestead Blog Hop! Yum! Definitely on my “try soon” list. I have quite a bit of blackberries this year I have tucked into my freezer. These looks absolutely delish!